How do I choose a band for my wedding? Having performed more than 1000 weddings in the past 25 years, we have come to realize the main qualities that brides look for in hiring a band. Obviously, the band has to sound great! 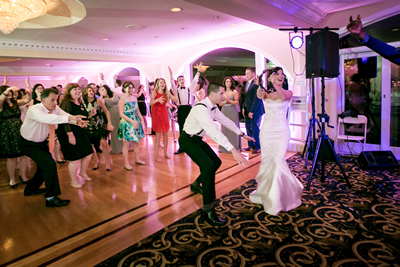 A band with great singers and accomplished musicians is a good start to creating a reception that everyone will rave about. But that’s not all . . . The band members have to enjoy what they’re doing, rather than just "going through the motions" at another gig. A band whose musicians are close friends, and are the kinds of friends that you’d like to invite to your wedding, is a step closer to choosing the right band. You’re getting closer . . .
You have to feel comfortable on a personal level with the band leader. This is the person that you will be working with for a year (or longer) from the time you book the band until your reception. Qualities like integrity, honesty, punctuality, and professionalism are a must for the person you are relying on to run the show and orchestrate your once-in-a-lifetime event. So how do you find a band with all of these qualities? Fortunately, you already have: Clockwork Boston and Clockwork New England! Give us a call or send us an email. What if you don’t know our first dance song? We will learn it! Or we can play the actual recording for you to dance to. Dancing to the recording is quite common, and for a lot of couples it removes those "first dance jitters" because they know exactly how it’s going to sound (and quite often they’ve been practicing dancing to the recording). Honestly, you won't offend us in the least if you ask us to "DJ" your first dance! How many hours does Clockwork perform for? Most wedding receptions are 5 hours long: 1 hour for cocktails, and 4 hours for the reception (dinner and dancing), and there’s a reason for that. 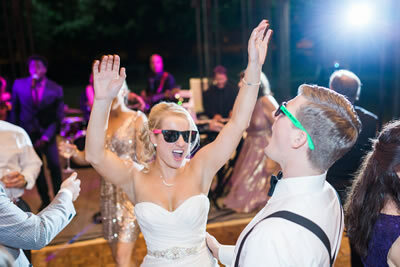 A four-hour reception seems to be the right amount of time to create a very fun atmosphere, to get everyone dancing, and have the energy peak before people get too tired. 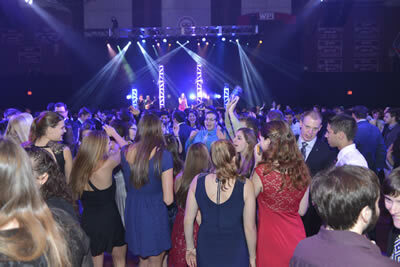 Keep in mind that after dinner, there is continuous high-energy music until the end of the reception. The band plays two dance sets, and we "DJ" a high-energy set of about 20 minutes in between these two sets. So, following dinner, there is high-energy dance music for about 2 ½ hours straight, and that’s usually enough for most people! That having been said, however, we have played 4.5 or even 5 hour receptions in the past. During a 4-hour reception, we take two breaks. The first is during dinner when the main course is being served. After dinner we play two dance sets, and bridge the gap between these two sets with the high-energy DJ set (about 15 minutes in length). Is music played during breaks? Yes. In fact, you can put together your own custom playlist specifying exactly which songs are to be played during each break. Just give us a list, and we'll put it together! Or you can rely on us to put together a great mix to "DJ" the breaks. Do you play more than one event per day? No. We perform only one event each day, thereby giving each event our undivided attention. Furthermore, you will never be charged a penalty or extra stipend if your reception happens to be during “crossover” times (from late afternoon into early evening). How do you keep people dancing for four hours? Getting your guests to the dance floor and keeping them there is our number one goal; isn’t that why you hire a band in the first place? 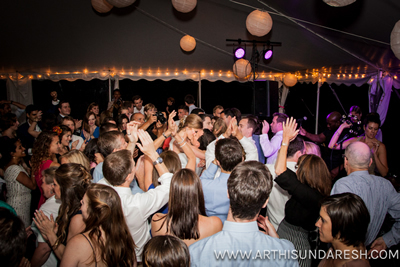 Having performed at so many weddings in the past, we have a good sense as to which songs to pick to get people on the dance floor. Once the dancing has started, we string songs together into medleys (so there’s not that awkward “dead air” in between songs), gradually building the energy from one song to the next.